Bryce Prince (74) crosses the finish line at Utah Motorsports Campus. Photo by Brian J. Nelson. GRANTSVILLE, Utah (June 28, 2016) — The MotoAmerica Superbike Championship of Utah was successful for both Riders Discount/Tuned Racing riders. Bryce Prince not only took two podiums this weekend, but also secured the Superstock 600 championship title. This is Prince’s first national championship. Quicksilver Powersports Lubricants extends their praise to Prince and the Riders Discount/Tuned Racing team. Tuned Racing owner Mike Pond is thrilled with how Riders Discount/Tuned Racing has performed this season. 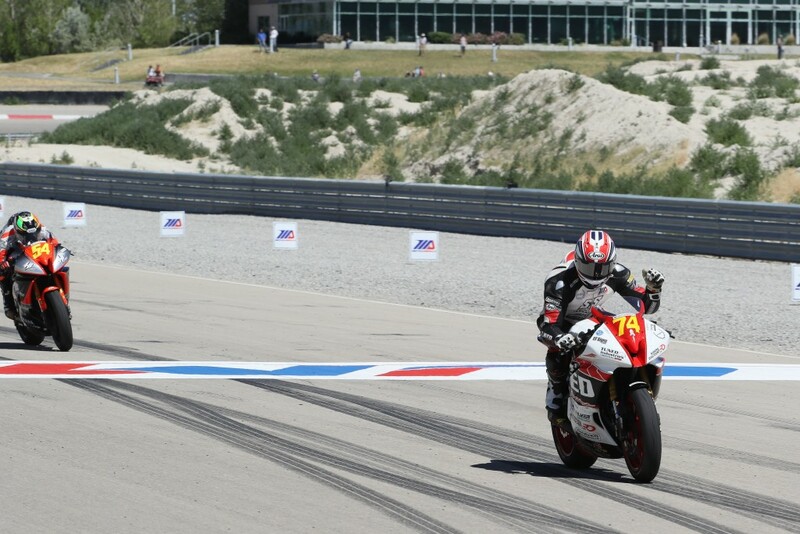 Despite five broken bones in his foot, Jason Aguilar also had a successful weekend at Utah Motorsports Campus. Aguilar took fifth in race one and the third spot on the podium alongside his teammate for race two.